When I started to seriously play the drums I realized I would have to keep track of my daily practice – as well as of my band’s current creative musings. So I was sure I needed a digital recorder, but unfortunately my expertise in terms of audio equipment was below 0. I had no idea what XLR, overdub or 4-channel recording meant. I now know what those terms mean and I’ll explain them to you in this Tascam DR-40 review. But surely you don’t want to rely on my opinion only. That’s why I’ve done a great deal of research to find out what other people – musicians, journalists and podcasters – think about the Tascam DR-40. So I’ll answer the most common questions people have about the Tascam DR-40and at the same time present you with its strengths and weaknesses. I’ll even be so bold as to show you a recording of myself made on this very digital recorder. I hope this Tascam DR-40 review can help you make an informed buying decision! What Is A Digital Recorder? Does it work on external power (AC adapter)? Does it have a built in speaker? Is it possible to disable the sound from the built in mics and just use external input? How good are the microphones? 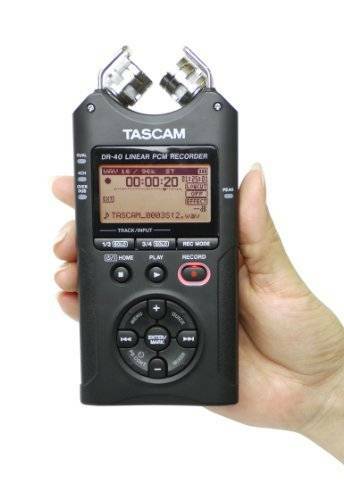 Which purposes can the Tascam DR-40 be used for? 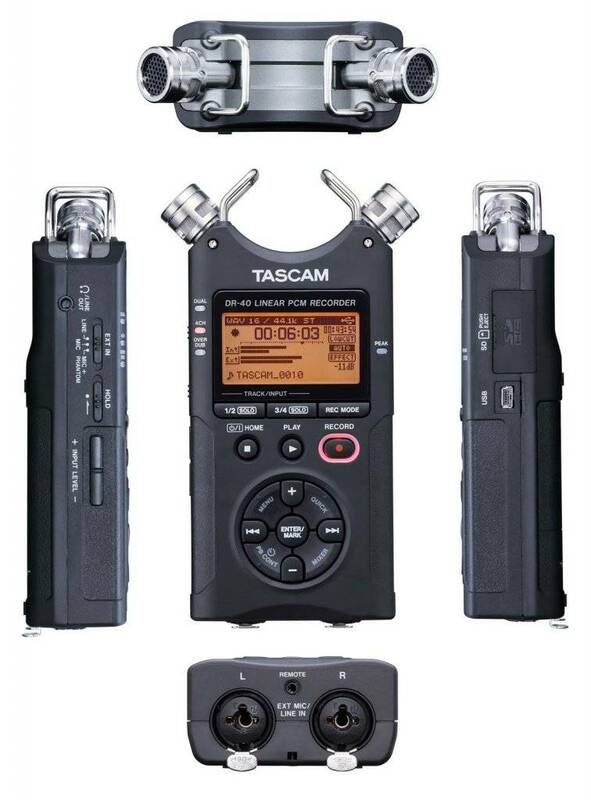 Tascam DR-40 vs Zoom H4N? Essentially, a digital recorder is a device which enables you can convert sounds (songs, seeches, interviews) into a computer-readable digital file. 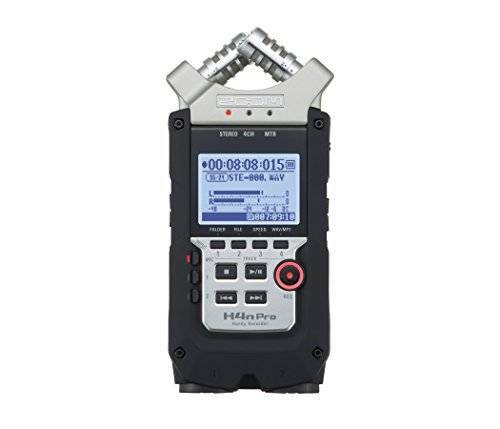 First, the digital recorder picks up sounds through microphones that are built into or attached to it. Then, the recorder transforms those sounds into a digital file. And this file can then be exported onto your computer – most often through a USB port or Micro SD card. People use digital recorders to caputer music tracks, for interviewing, podcasting, field recording etc. So, if you want to preserve music or voice quickly and at good quality, a digital recorder is your weapon of choice. …for if you don’t want to only rely on the DR-40’s batteries, you can use a macro USB cable (like the one used for printers) to charge / power it through a computer or USB-charger. A built-in speaker is included for checking recording without headphones, but this won’t give you a very high sound quality. It’s only made for a quick check after all. If you’re listening for recording quality, you would have to use ear- / headphones. The Tascam DR-40 has 2 XLR inputs for the external microphones you could (but don’t have to) use. In terms of outputs, you’ll find a 1/4” jack (like the one on your mobile phone) for listening to recordings on your headphones. In order to disable the internal mics, you need to be recording in Mono or Stereo. Dual is the recording mode for concerts or live band sessions while 4-channel recording allows you to record with both the internal and external mics at the same time. So, 4-channel recording is best suited for situations in which you want to record two or more people at the same time. I have nothing to complain about the 2 built-in condenser microphones as well as the internal preamps. They are susceptible to noise, which might be produced by you holding the Tascam DR-40 during recording. This is usually not the case with external condenser mics. If you don’t want to buy an external one, your best bet to cancel out unwanted noise is this tripod. It will hold the recorder during the use and prevent the noise. You’d have to buy it separately though. Or you go for this Tascam DR-40 bundle that also includes batteries, earbuds and input + output cables. As you can hear above: I’m a drummer and I’ve been using the Tascam DR-40 to my fullest satisfaction for years. And the answer is: for me it always has. And that’s because the DR-40 has the dual recording mode mentioned above. In this mode, the DR-40 produces two stereo recordings with one at room volume and the other 6-12 dB lower. So in case something unexpectedly loud comes along, your second recording will still capture your music just fine. To my ears, the internal mics do just fine. Simply set the limiter to automatic, so exceptionally loud notes won’t be lost. Then put it about 3 feet away from yourself and start recording. It will do a great job. However, if you want a more professional result, upload the recording to your computer and edit it to your liking. Or use an external mic (this Behringer is a good one) and record with studio-like quality. The Tascam DR-40 is strong when used in environments with a lot of noise (such as convention floors etc.). In general, its microphones do their job much better than those of other recorders in the same price range such as the Zoom H4N. As for field recordings, I’m told that the Tascam DR-40 is a very good option on a budget. 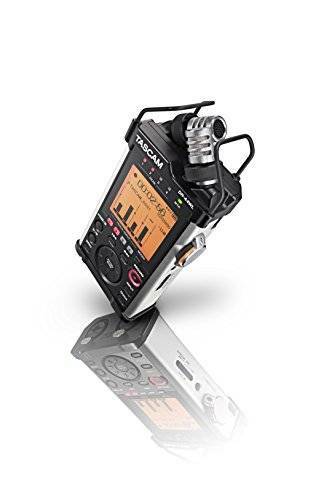 But of course it can’t compete with dedicated field recording kits such as the Tascam DR-680MKII which you would use with an external mic and, possibly, a wind shield. And again, if you want to go professional here, the DR-40 won’t let you down. Plug in 2 external mics, set it to 4-Channel Mode and you’ll be able to record 2 separate audio tracks. Plus: you can then use the internal mics either for recording a backup track or for picking up the ambience of the room. This will make your podcast sound really professional. It will show you a welcome message and then it will take you to the home page where you can record audio, change the default microphone settings, view the files you have recorded and delete them. Press the RECORD button once. You will notice that the levels on the screen will start moving. This doesn’t mean you have started recording. It only means the DR-40 is in standby-mode and ready to record. Press RECORD once more to actually start recording. Pressing RECORD again will pause your recording. As for mixing & mastering: The Tascam recordings work in virtually any recording software out there. Logic, Garage Band, Audacity (free) and a dozens others – you can use them all. Every file recorded with the DR-40 will be given a number that ascends in value with each recording. This number is put behind a file name of your choice. E.g. : “myawesomerecording0027”. Overdubbing means to record on top of an existing track or piece of music. A common application of this would be a band recording a studio album. In this process, the drums would usually be recorded first – and the guitar, singer etc. would be recorded afterwards and while listening to the drum track. These several dubs put on top of each other would then result in the final “full” recording. Navigate to SOURCE on the REC MODE screen and select either the built-in or external microphones as input source. Tascam updates its firmware frequently which allows your DR-40 to stay up to date and to run smoothly. You can download the latest firmware. The Tascam DR-40 V2 comes at a much higher price than the DR-40 itself. Yet, the only difference between the 2 seems to be the 4GB SD card – and I think a 2GB card is more than enough to start off with. Apart from that, the DR-40 Version 2 comes with a newer firmware (since it’s from 2015) – but I’ve shown you how to upgrade that manually above. So is the price difference justified? I don’t think so. To me this seems like an upgrade in price rather than in functionality. The Tascam DR-44WL comes with WI-FI and a bigger screen. This might or might not be important to you. The mics of the DR-44WL by contrast cannot be adjusted. But instead, it has a shock handle that avoids any unwanted sound such as wind or you handling the device while recording. The shock handle basically holds the microphones firmly in their places. The microphones have this little protective cage so to speak. The mics on the Zoom H4N, so they can easily get damaged when something hits them or you don’t protect the recorder while transporting it. It comes with an AC adapter, while the DR-40 only comes with batteries. All in all, I can full-heartedly recommend the Tascam DR-40. It has served me well for recordings in all kinds of music settings, styles and decibel levels for years. And my research tells me that other people think so too. Plus: the same thing goes for journalistic interviewing and podcasting. So click the image above to check out what other people say on Amazon! I hope this Tascam DR-40 review was helpful to you! If you’ve got a question or experience using this device, you’re most welcome to leave me a comment below. 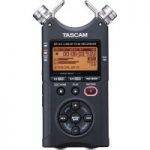 And if you should decide to buy the Tascam DR-40, please consider going through the links on this site. This will reward me for the care and effort I put into this review by giving me a small commission. Note that I have no reason to make a product better than I truly found it to be as I’ve reviewed lots of commission-generating products here at Kickstart Your Drumming. You can also check out my reviewing ethics over here. …I’ve never had that and I can only think that perhaps the songs aren’t stereo either? How did you put them onto the Tascam? These r songs that the band I play with recorded & I use to practice . Cool, I’m glad we got this figured out! with it -while you are recording. Have you ever experienced a delay or time-stretching in your recordings? like, if you recorded something for exactly 60 seconds, when analyzed later (in a DAW) it would actually be 60.25 seconds. Thus, by degrees, each measure in your music is steadily creeping off meter. That’s what I’m seeing with my dr-40 and i’m wondering if it’s because I have a bad unit, or because I’m doing something wrong. It seems every 5 seconds the dr-40 elongates whatever sound is going on and pauses while it writes to file, and then continues. Sorry this took a bit! That sounds weird and I’ve never noticed that with my Tascam Dr-40. I think you should contact Tascam’s customer support regarding this. Keeping my thumbs pressed that they’ll be able to resolve this! Thanks for the reply! They never got back to me. But I was within return limits, so I received a new unit, it’s working great. Good, I’m happy this worked out! Thanks for the info, Mike! I bought the DR-40 mostly to record interviews and to possibly do a podcast, so I need an external mic. I bought a condenser mic. I have switched the external mic switch to the “mic + phantom” setting, but when I put the recorder on record standby, I can’t hear anything but white noise, even though the recording levels dance a bit. Are there settings that I need to adjust to make the mic works, or should I consider taking the recorder back to be repaired/replaced? Sorry this took so long – I was on vacation! Have you tried switching the phantom power off. I once found this helped with mine. If not, this could be due to the mic and you might find more information here. This review is great, but I didn’t find information about the preamps quality, as I am voice-over artist, I look the info for the preamps. Currently I use a Zoom H4n and it’s a piece of &*^%$, the noise level is unacceptable and the gain is very low when using with a Rode NT1 or Rode N1000. I feel the Zoom H4n is very bad with external devices. Have you testeed for voice both recorders? Can you give an opinion about the noise levels? I think this video will give you a good impression of the voice-over quality of the Tascam DR-40. I record our band with my DR40, then make CD’s and mail back to my bandies. It’s awesome. Thanks for your feedback on the Tascam DR-40 and sorry it took me so long to respond to this! For those cases, I swear by the Shure SM-57. They sure aren’t the most sophisticated condenser microphones around, but I’ve found the to be my best option on a budget. One more question if you don’t mind. I think I will get the Samsons. The question is…. Do I need extra Phantom power, or can I use the USB power source. I read one review that said I would not need phantom unless it was a “dynamic” mic. What say you? Yes you need to use phantom power with the Samson CO2, but since the Tascam has phantom power, that shouldn’t be a problem. Only be aware that this reduces the operating time of the DR-40 when using it on battery (to about 2-3 hours I’ve heard). So I looked at the link for the Mics..thanks! This one looks to be an instrument one which is great, but I am looking to record an entire room where we practice..shouldn’t a condenser mic work best in this application? I may be way off so sorry if this is not a smart question. In that case, your best bet is indeed a condenser mic. And the cheapest option with solid performance is – in my opinion – the Samson CO2. When I record bass by plugging in the bass directly to the DR-40, I can barely hear it without turning the input up until the sound gets distorted. The same applies for my Yamaha S80 and microphone. I’m extremely new to this, so are there other factors that I’m not considering? Any help would be appreciated! Thanks for your question and sorry for taking so long to get back to you! From what you say I can’t pinpoint the issue, but perhaps this tutorial will help you out. It focuses on microphones, but since you seem to face the issue across the board, fixing it for one input source should fix it for the keys and the bass too. Can I record in dual mode with only 1 external microphone, and if so, does it matter which side i plug the mic in? I only have 1 shotgun mic. You sure can. Dual mode means that the Tascam will produce 2 tracks with one at a different decibel level from the first one (you can set the exact amount of decibels yourself). So if the first track gets distorted, overloads etc. – you might still be able to use the second track. This is all done with one microphone plugged into XLR “1”. Thanks for your question. That should be easy! You need a cable like this and use it to connect the headphone / audio out of your phone to the 2 headphone jacks of the DR-40. Then simply record “stereo ext mic 1/2” and you should be recording your phone’s music alright. A few years ago I bought an M-Audio Micro-TrekII. Now It doesn’t work, but my question is can I run the old files from the SD cards to my new Tascam DR-40? I believe the cards are 2GB. Will it work? Yes, the Tascam does accept SD cards from 64MB to 2GB as recording media. Is that what you mean? Apologies for bringing this post back up. I had a question about recording interviews using the Tascam DR40. I want to record an interview with 1 person and use an external mic to direct at him and keep the Tascam directed towards me to pick up my voice. Do I set it up to record in Mono? And if I do, wont the playback play the sound on one side of the speakers only? I just want to make sure that when people listen to the interview on headphones, the interviewees’ voice doesn’t only come out from one side of the headphone. I would appreciate your help in this. Recording in mono mode with one microphone is exactly right and will result in a recording that’s audible in both headphones at the same time. By contrast, the thing you’re concerned about (hearing the recording only on one side of the headphones) would happen if you’d record stereo with only one mic. I know that’s completely counterintuitive, but that’s how it works. Read on here for a little more detailled explanation. Thank you so so much for such a detailed, informative yet easy-to-understand article! This has empowered me with the knowledge to film my teaser so I am super grateful! Great, thank you for your kind words!